This is the second post in a multipart series on political branding in 2016. Click here to read part one, part three and part four. I’m a junkie for US politics. I follow it in the news, I study candidates’ political systems and I never miss a debate. In my last blog post I looked at the importance of logos in political branding. This time I’d like to focus on slogans. From “Tippecanoe and Tyler Too” to “I Like Ike,” slogans have been at the heart of US presidential campaign messaging throughout our nation’s history. These mottos and phrases help bring the positioning and benefits of a candidate to life. They’re found on T-shirts and coffee mugs, in Twitter bios and Instagram posts and repeated out loud thousands, if not millions, of times. It’s easy to feel like they’re all saying the same thing. 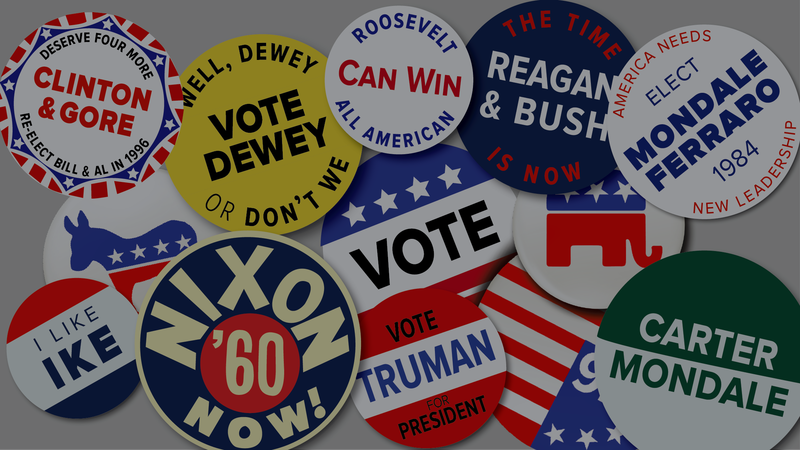 Even the presidential campaign slogans that stand out today aren’t new. 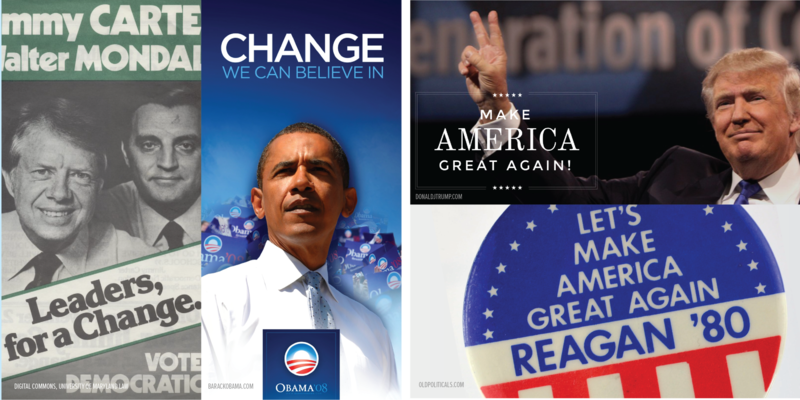 Several candidates, dating back to Thomas Dewey in 1944, have used the highly emotive concept of “Change” most recently employed by President Barack Obama in 2008. And Ronald Reagan’s powerful “Let’s Make America Great Again” is now being used near verbatim—and was trademarked—by Republican candidate Donald Trump. Whether a candidate is Democrat or Republican, establishment or populist, the campaign message positioning will always vary. This means that what a candidate says is just as important as how they say it. The tone they use can directly impact the success of delivering a message. Based on these definitions, I plotted campaign slogans from the last nine US presidential elections. The results were fascinating. 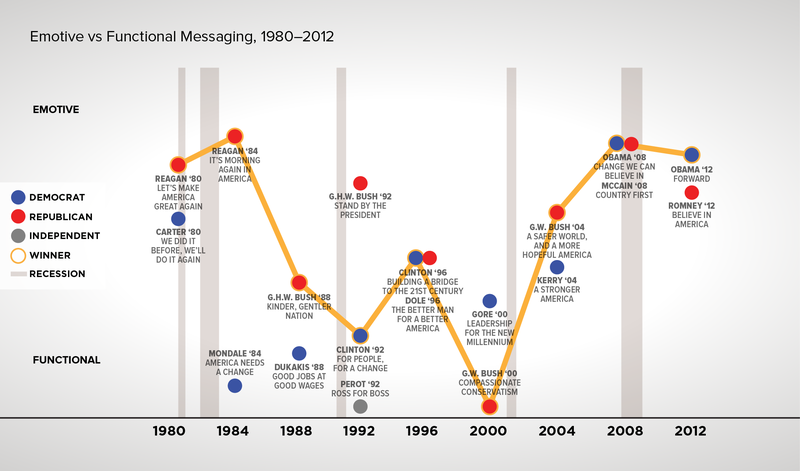 Since 1980, American citizens have elected the more active, emotive message seven out of nine times. Keep in mind, context matters here when I am using my own judgment to evaluate whether something is emotive or functional. For example, a phrase like “Stand with George” is more meaningful and compelling if George is an incumbent, versus someone new to the national stage. There was an immediate connection to be made: People want something to believe in. It’s part of our innate desire to want to feel included and part of a community. Emotive, actionable messages help to empower and unite us as citizens. To be elected, a candidate must understand how to communicate to the mood in America and appeal to the most basic desires of its people. 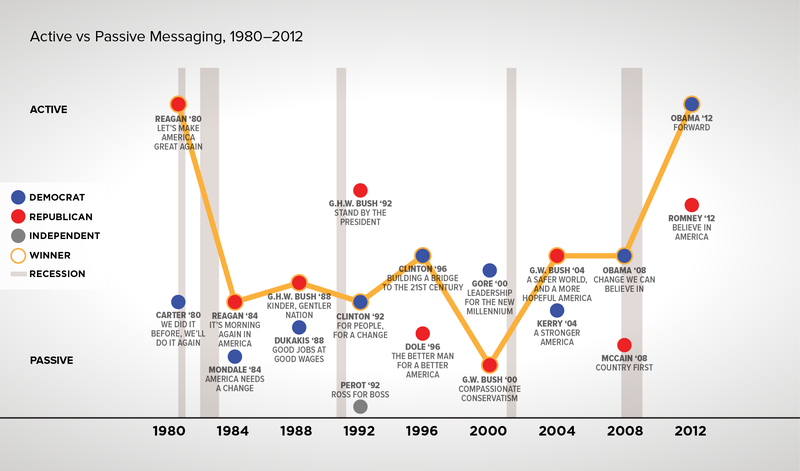 Most notably represented in the charts above: following economic recessions, political turmoil and crises domestic or abroad, you see a spike in support for a highly active, emotive message. Now let’s not confuse an active, emotive message with a one-way ticket to the oval office. As the culture and mood of the country evolve, what wins during one election cycle might not win in the next. Heading into the 2016 election, both Republican and Democratic voters see the economy as the top issue and are finding value in new ideas rather than experience. The majority of candidates are adapting to this attitude by offering emotive messages that focus on delivering a brighter, energetic future. And they’re using words like “new,” “reignite,” “revolution” and “inspire” to hit the mark. 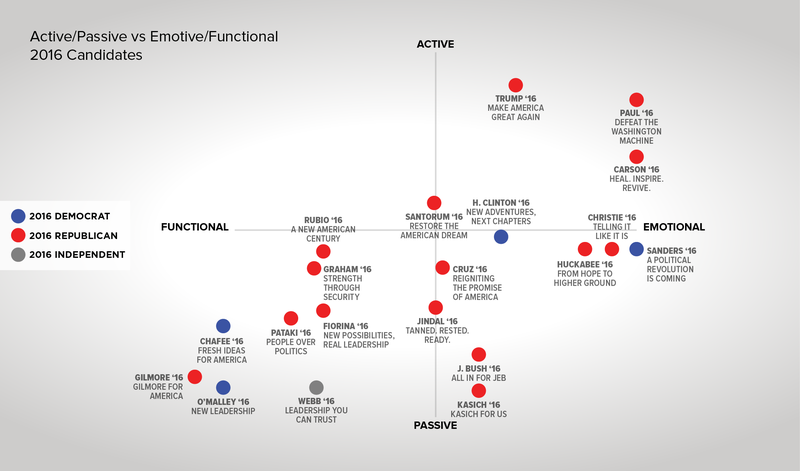 Because I just can’t get enough political campaign data, I took the liberty of plotting the slogans of the 2016 candidates. I’m curious to see if history repeats itself. Will a candidate with an active, emotive message win in the end? Agree with me? Disagree? Like analyzing politics as much as I do? I’d love to hear from you. Email me at meredith.post@lpk.com. LPK Senior Copywriters Tim Helmers and Adam Sievering contributed to this post.